U.S. Federal Reserve Wednesday launched the second phase of its quantitative easing program , the so-called QE2, saying it will buy up to $600 billion more in long-term U.S. Treasury bonds to help stimulate a U.S. economy that's growing too slowly. The Fed said the new asset purchases would take place through June 2011 at about $75 billion per month, and when combined with existing asset purchases, would total about $110 billion per month. The vote was 11-1, with Kansas City Fed President Thomas Hoenig again voting against the program, dissenting for the seventh straight Fed meeting. Hoenig "believed the risks of additional securities purchases outweighed the benefits" the Fed's statement said. The Fed maintained its fed funds target range of zero to 0.25%. In its statement, the Fed also maintained its language regarding monetary policy, reiterating that it will likely keep short-term interest rates at "exceptionally low levels" for an "extended period." The Fed added that considering its dual mandate of price stability and maximum employment, "Although the Committee anticipates a gradual return to higher levels of resource utilization in a context of price stability, progress toward its objectives has been disappointingly slow." The Fed said it was expanding its asset holdings "To promote a stronger pace of economic recovery and to help ensure that inflation, over time, is at levels consistent with its mandate," adding that it will "will regularly review the pace of its securities purchases and the overall size of the asset-purchase program in light of incoming information and will adjust the program as needed to best foster maximum employment and price stability." The Fed's announcement pushed U.S. stock markets lower, at least initially, with some see-saw action afterward during afternoon trading. The interest rate on the 10-year U.S. Treasury note rose to 2.61% from 2.54% before the announcement. 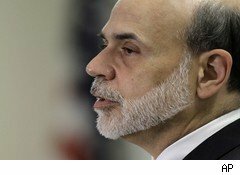 Although plenty of economists oppose additional stimulative action by the Fed, many others argue that more action -- conventional policy or quantitative easing -- has become necessary. U.S. GDP grew 2% in the third quarter, after expanding at 1.7%, 3.7% and 5% in the previous three quarters, respectively. The most recent pace is too slow to lower the nation's high 9.6% unemployment. Growth of at least 2.5% would be needed to do that, and the duration of the expansion required to return the nation to normal unemployment levels of 3.5% to 5% speaks to size of the task at hand for policymakers. About 14.8 million Americans seeking work are unemployed. Another 7 million to 8 million are part-time workers who want full-time work but can't find it. That translates into an underemployment rate of 17.1%. Assuming 250,000 new jobs per month, it would take about eight years to create enough jobs to employ both those currently out of work and new entrants to the workforce. Even though not all of those roughly 15 million adults will keep looking for a job. Some will retire. But the economy isn't generating anywhere near 250,000 new jobs per month. The private sector hasn't added 200,000 jobs in any month since the recession started in December 2007. That will have to change if the nation hopes to return to employment levels that existed prior to the financial crisis.